03 April/Day 01: Arrival in Kathmandu Airport and transfer to hotel Yak and Yeti or similar hotel accommodation in Kathmandu (1350M/4,430ft). 4-5 April/Day2-3:Preparation and briefings at the Departments of Tourism. Last minute shopping. 06 April/Day 04: Fly from Kathmandu to Tumlingtar. 50min.Drive to Num (1980m/6,496ft)6-7hrs.Lodge/camping accommodation. 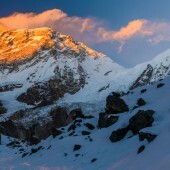 07 April/Day 05: Trek from Num to Seduwa (1500m/4,922ft) 6-7hrs. Lodge/camping accommodation. 08 April/Day 06: Trek from Seduwa to Tashigaoun(2100m/6,890ft) 6-7hrs.Lodge/camping accommodation. 09 April/Day 07: Trek from Tashigaoun to Khongma Danda(3500m/11483ft) 6-7hrs.Lodge/camping accommodation. 10 April/Day 08: Exploration and Acclimatization day at Khongma(3500m/11,483ft) 06-07hrs.Lodge accommodation. 11 April/Day 09: Trek from Khongma to Dobsto (3650m/11,975ft) 6-7hrs.Lodge/camping accommodation. 12 April/Day 10: Trek from Dobute to Yangle Kharka (3600m/11,811ft) 6-7hrs.Lodge/camping accommodation. 13 April/Day 11: Trek from Yangle Kharka to Langmale Kharka (4410m/14469ft) 6-7hrs.Lodge/camping accommodation. 14 April/Day 12: Exploration and Acclimatization day at Langmale Kharka(4410m/14,469ft) Lodge/camping accommodation. 15 April/Day 13: Trek from Langmale Kharka to Makalu Base Camp (5018m/16,464ft) 6hrs.Lodge/camping accommodation. 17 April/Day 15: Trek from Hillary base camp to Advance base Camp (5600m/18,373ft) 5hrs. 26 May/Day 54: Trek from Advance Base Camp to Yangli Kharka (3600m/11,811ft) 6-7hrs.Lodge/camping accommodation. 27 May/Day 55: Trek from Yangli Kharka to Dobato (3650m/11,975ft) 6-7hrs.Lodge/camping accommodation. 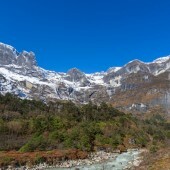 28 May/Day 56: Trek from Dobute to Khongma (3500m/11,483ft) 6-7hrs.Lodge/camping accommodation. 29 May/Day 57: Trek from Khongma to Seduwa(1500m/4,922ft) 6-7hrs. Lodge/camping accommodation. 30 May/Day 58: Trek from Seduwa to Num (1980m/6,496ft) 6-7hrs.Lodge/camping accommodation. 31 May/Day 59: Drive from Num to Tumlingtar. 4hrs.Lodge accommodation. 01 June/Day 60: Fly from Tumlingtar to Kathmandu (30min) transfer to request category hotel accommodation in Kathmandu in B&B Plan. 02 June/Day 61: Leisure day & shopping in Kathmandu; Fair well-Celebration dinner with culture program in the Evening.